Welcome to the GoBots Wiki! Welcome to GBWiki, the GoBots Wiki. 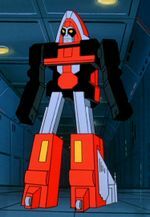 This sister site to TFWiki is an unofficial knowledge database of the GoBots franchise. If you start working on a new article for the GoBots Wiki, add it to the list on the WIP page, so that other users know! A proponent of "might makes right" who follows only the strongest leader, Fitor is fanatically loyal to Cy-Kill to the point that he will gladly sacrifice his life for the Renegade cause if need be. In turn, Cy-Kill affords Fitor respect, considering him a vital cog in the Renegade machine that he will go to great lengths to preserve. He serves as Cy-Kill's second-in-command, usually remaining behind on Gobotron or on Roguestar to lead the Renegades while his master is busy elsewhere. ...that you can add your own "did you know" tidbits right here? ...that Bladez was the only Monster GoBot not to appear in the Challenge of the GoBots cartoon? This page was last edited on 25 November 2018, at 16:10.